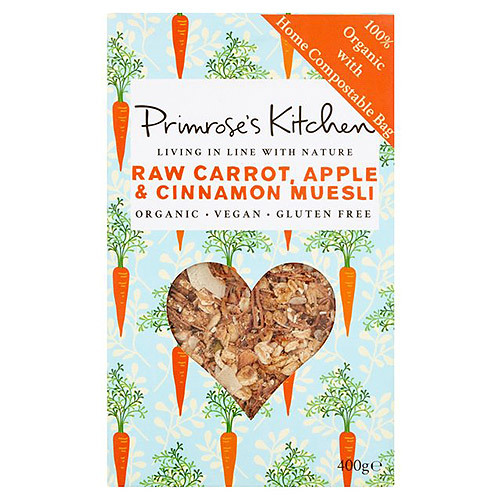 Lovingly made with fresh carrots, raw nuts and seeds for a granola style crunch and virgin coconut oil to aid digestion, the Carrot, Apple & Cinnamon Muesli is your nutritious wake-up call. Try this delicious muesli mix with cold or warm milk, or try it with yogurt. Can also be eaten dry as a snack, or sprinkled on a smoothie. Gluten free oats*, carrot* (22%), coconut nectar*, sunflower seeds*, pumpkin seeds*, linseeds*, virgin coconut oil*, almonds, apple* (1%), cinnamon* (1%), chia seeds*, psyllium husks*. Packed in a facility that handles other nuts & sesame. Below are reviews of Primrose`s Kitchen Raw Carrot, Apple & Cinnamon Muesli - 400g by bodykind customers. If you have tried this product we'd love to hear what you think so please leave a review.